All calendar proceeds will go directly to The Leukemia & Lymphoma Society! Want to get things DONE this year? Your OLD calendar KEEPING YOU DOWN? Making you feel like you CAN’T get things accomplished? Clearly it’s the calendar’s fault. Maybe it’s ALL calendars faults. WTF Caesar? Well who needs a calendar, when you can have a CAN-ENDAR! That’s right, introducing the first ever Immaculatize CAN-ENDAR! What’s a CAN-ENDAR? It’s just like a regular calendar, but filled with optimism. No, not like boring motivational calendars that you’ve used to no avail in the past, but REAL LIFE GENUINE AUTHENTIC OPTIMISM! Look at November for example. In a regular calendar that would just be November. BORING. WE GET IT. On the Immacualtize CAN-ENDAR, you don’t get November, you get NO VEMBER NO PROBLEMS! That’s right, we’ve messed with the words to make them more FUN! And when things are more fun, you’re more likely to do them, and doing things is what this CAN-ENDAR is all about. PLUS! There are two handy blank spots each month where you can pencil in your two most important goals. That’s right it’s also utilitarian! It’ll look good on a wall, great on a bulletin board, and amazing in a frame. All the while inspiring you to get things done. And the best part of all? 100% of proceeds will go to support The Leukemia & Lymphoma Society! For more info you can also join the Facebook Group in support of this cause. So don’t hesitate, ACT! 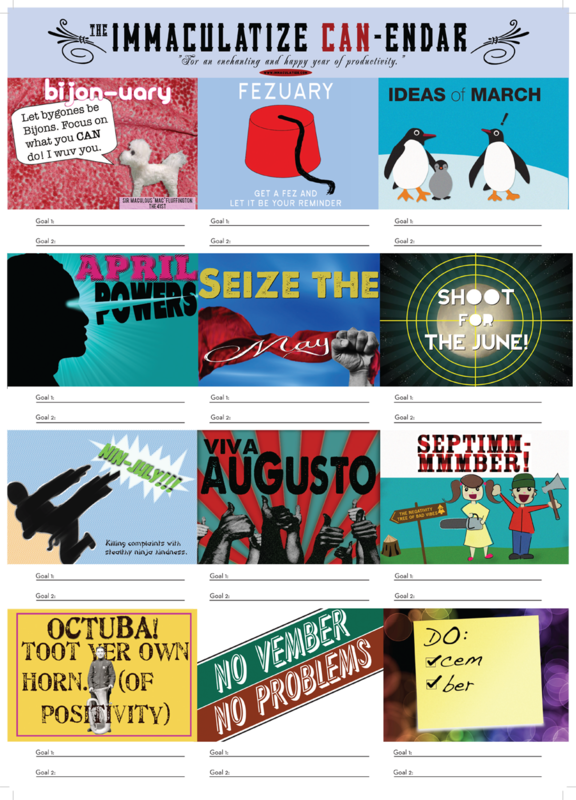 And get yourself one of these handsome wall calendars that’ll keep you motivated and help you change the world in 2012. Or at least get that 30 Rock spec script done before May. Calendar designs by Valerie Dambold, Jamie Flam, Vanessa Ragland, Jon Rojas, and Kasey Baker-Vermulm.